The Seafaring Festival of Music and Song which will take place in Waterford from the 28th - 30th May 2010, was officially launched by the Mayor of Waterford, Cllr. John Halligan, in the Theatre Royal on Thursday 4th February. Speaking to invited guests and sponsors, he said he welcomed the Festival for the City of Waterford which has a proud maritime tradition and he looked forward to seeing (and hearing!) all the groups that will gather in the City, for what should be a lively weekend of music and song. The Mayor of Waterford, Councillor John Halligan and the City Council announced a new, exciting and colourful festival for the South East this year. This festival will celebrate the unique position which Waterford Port has held in terms of the evolving history of Ireland. Waterford was the main port into Ireland for many years and has a long association with maritime matters and a heritage of seafaring that reaches out to all corners of the world. This three day event is called The Waterford Seafaring Festival of Music and Song and will be staged in hotels, bars, along the Waterfront and other outdoor venues from Friday 28th May 2010 to Sunday 30th May, with daytime and evening entertainment. 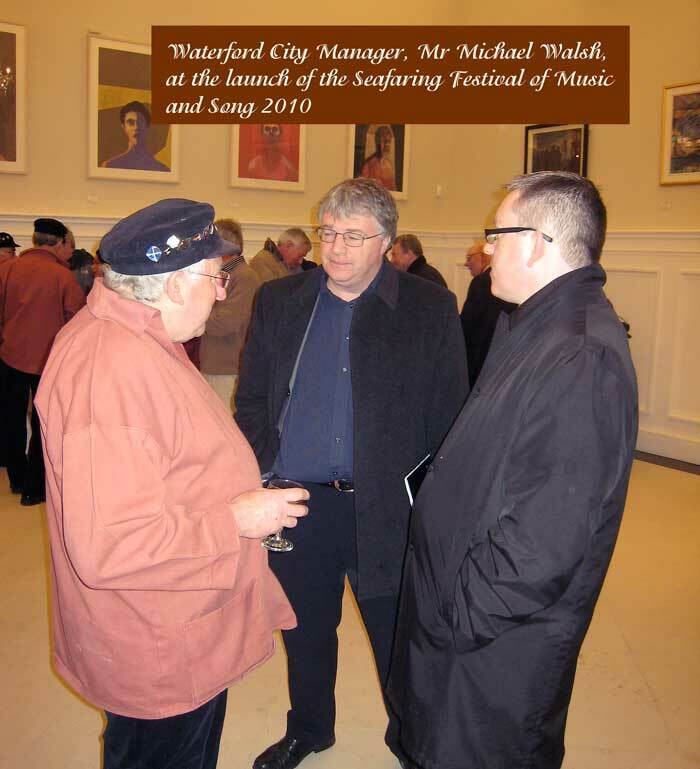 2010 is the International Year of the Seafarer and is a fitting opportunity to reclaim the maritime musical heritage of the South East and Waterford in particular. Sea Shanties are the songs of Seafarers and brought much relief from the harsh working conditions on the high seas. The city will be hosting musical groups coming from Holland, Germany, Norway, Denmark, the UK Wales and France. There will be lively performances in our halls, streets, hotels, taverns and bars sharing the music and songs of the sea throughout the weekend. Coastal communities throughout Europe have been enjoying this colourful aspect of marine heritage revival for many years with large groups of singers and musicians gathering for a weekend of fun and cultural exchange. This festival will awaken a sense of the great tradition of seafaring from Waterford Harbour: Trading farming produce, leather goods and woollens from the South East of Ireland for French and Spanish wines; And also cotton, hard woods and tobacco from the New World. Much can be said about the renowned shipbuilding industry and the provision of processed meat and biscuits for the 'cross Atlantic Trade. Sadly much of the seagoing activities have diminished over time and most of our maritime artifacts lie at the bottom of the ocean, lost to Atlantic gales and tragedy of war. However the festival can recall the traditions of seafaring in music and song which accompanied these sailing ships around the world. The unique layout of Waterford port whereby ships can navigate right into the heart of the city, with a wonderful quayside and a fine river estuary as a base from which to work.There are high hopes of building new interest in both remembering 'times past' and also future development in the Marine Leisure Industry. The programme of events will be published in March and will include a schedule of music venues and Quayside activities. It will be an inclusive celebration of Waterford's musical talents past and present with an invitation to local 'Groups' to participate. 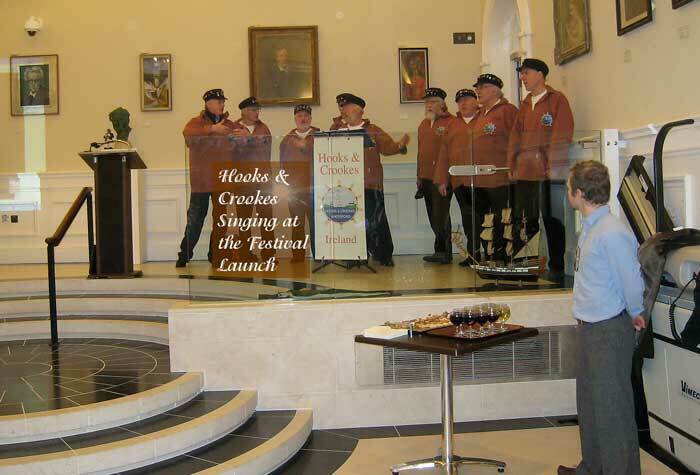 The Festival is being organised by the well known sea shanty group Hooks and Crookes. 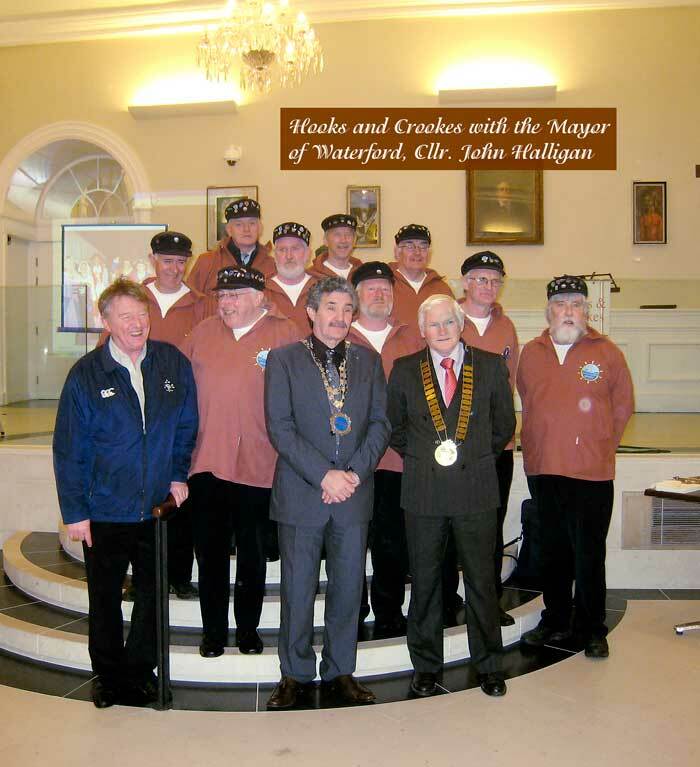 This group got together for the Tall Ships visit to Waterford in 2005, and they haven't stopped singing since! In the past few years they have performed at Maritime Festivals in the UK, Holland, Norway, Germany and France. They have been guests at many Irish festivals, in Birr, Clare, Dublin, Wexford and last year on the Quays of Galway for the Round the World Yacht Race Event. They have researched songs of the sea and have produced a number of CDs. With the experience gained abroad they are now bringing home this vibrant aspect of Maritime Heritage. They have invited their many friends and acquaintances to add a truly International flavour to this Festival. The Waterford Seafaring Festival is a demonstration of the City Council's determination to promote Waterford and its many positive aspects to a new audience; together with Failte Ireland, Waterford Chamber of Commerce, the City Hotels, City Traders and local Vintners. The festival promises to be a great attraction and boost to the city which has seen some difficult times of late. This is a new and attractive festival for the South East which it is hoped will reach out to all neighbouring coastal communities. There is considerable voluntary work on behalf of the organisers and support groups to make the festival happen which will act as a bonding exercise for future activities. As the festival is scheduled for the last weekend of May, which is the UK bank holiday, it is anticipated that large number of visitors will attend for the weekend and avail of the great value in Waterford. Waterford will be hosting the Tall Ships Race for 2011 and in some ways this new festival is a fitting curtain raiser to this world renowned and prestigious event which takes place at the beginning of July 2011.